Gordon Jacob: Suite "William Byrd"
This is truly a delightful set which brings together a number of fine composers such as Eric Coates, Percy Grainger and Leroy Anderson together with a host of others who are less well known than others. 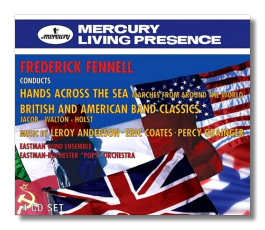 Frederick Fennell was truly a legendary name in Mercury circles having recorded a large corpus of short works with the equally legendary Eastman-Rochester Orchestra. The first disc includes a host of splendid marches that will surely raise the spirit of anyone down in the doldrums. These include works by Sousa, Tieke, Prokofieff, Alford, Meacham and Coates and all are recorded in what can only be termed as stunning Mercury sound. Fennel was also a dab hand at what is now termed as British Light Music and his recordings of Percy Grainger miniatures and suites by Eric Coates are truly memorable although for nostalgia purposes, they will not displace Reginald Kilbey, at least for me. Leroy Anderson is a composer that perhaps does not feature so much in the public consciousness but Fennell directs the music with a sympathetic vein that makes it quite dashing and beautiful. The final disc includes some wonderful arrangements for wind band that include a rip-roaring account of Walton's 'Crown Imperial' march. I also enjoyed music by Clifton Williams and Holst's 'Hammersmith', all given sterling performances by the Eastman Wind Ensemble. As already indicated, these classic Mercury recordings have really come up trumps with the engineering that borders on the superb. Ivan March's short but succinct essay makes interesting reading and I wouldn't hesitate recommending this fantastic set for some quiet but nostalgic Sunday afternoon listening.